Anorexia nervosa (usually just called anorexia) is an eating disorder. People with anorexia think that they are fat, or desperately fear becoming fat even if they are very skinny. To try to lose weight, anorexics do not eat enough. When they do eat, they do not eat the amount of food their body needs, in an effort to avoid gaining weight. This causes them to lose too much weight too quickly. This is very harmful to a person's body. There are various treatments for anorexia. One example is the Maudsley Method. This type of treatment is for patients who are 18 or younger. Two thirds of adolescent anorexia patients are 'recovered' at the end of this treatment. People with anorexia are more likely to die than people with any other mental illness. Doctors use the Diagnostic and Statistical Manual of Mental Disorders to make a medical diagnosis and decide if a person has anorexia or not. Four signs of anorexia are listed in the manual. People do not have to show all four signs for the doctor to decide that they have anorexia. People with anorexia do not want to keep a body weight and BMI that is normal for their age and height. People with anorexia think that they are fat. They are afraid of gaining weight. People with anorexia have low self-esteem because of the shape or weight of their body. Also, they do not think that low body weight is a problem. A woman with anorexia might not have their period multiple months in a row (one period is sometimes called a menstrual cycle). They also must make sure the woman is not pregnant and has not had their periods stop permanently due to their age, which is called menopause. There is no single cause of anorexia. Researchers believe that it is caused by a combination of biological and environmental factors. It has been linked to the media. Many people think that anorexia is caused by wanting to be thin like models in magazines. However, it is not that simple. People who develop anorexia tend to be perfectionistic. They are also more likely to have problems socializing. There has been research about the link between anorexia and antisocial personality disorder, a disorder that involves problems with socializing. Another symptom of antisocial personality disorder is OCD, which has also been linked to anorexia. 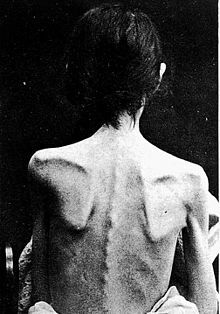 Starvation is known to create antisocial behavior so there needs to be research that compares those traits in anorexics with people who have recovered. This page was last changed on 13 April 2019, at 21:54.